Montegrappa has created a pen, watch and cufflinks collection that strives to serve as Guardian Angels for the owner. For more than a century Montegrappa has been crafting high-quality writing instruments in Bassano del Grappa, North East Italy. One of their latest special editions is the My Guardian Angel Collection. Montegrappa felt humanity has always found comfort in Guardian Angels and kept items like rosary beads and mezuzah close for guidance and support. Thus Montegrappa sought to create a lucky charm that would symbolise the spirit and offer hope and comfort to a person. The resulting My Guardian Angel collection is strikingly beautiful and Montegrappa hopes that it will comfort the holder and remind the individual of the existence of a higher spirit. 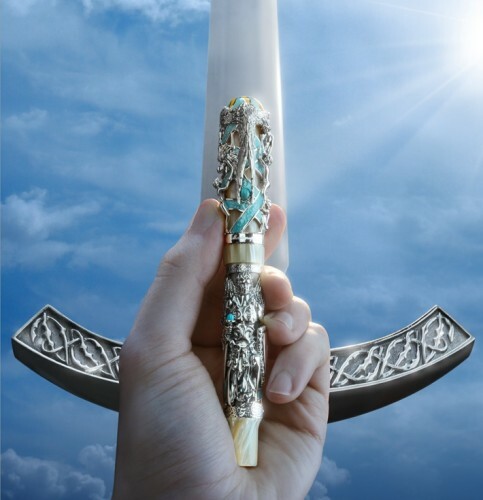 The design of the fountain pen features an angel standing tall on the barrel, with sword and shield, the clip taking the form of an angel’s wings. The cap’s top is a dome of blue, inlaid with the rays of the sun. 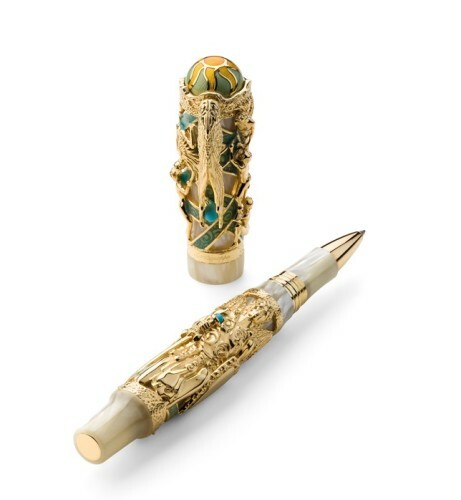 The talismanic pen by Montegrappa features engravings in sterling silver or 18k yellow gold, inlaid with sky-blue enamel and turquoise details. Offered along with the pen are matching cufflinks and wristwatches. The cufflinks feature an angel armed with sword and shield, while the watches carry a motif of wings and sun rays. Montegrappa has issued 1,000 Sterling Silver Fountain Pens, 912 Sterling Silver Rollerball Pens and 1,912 Sterling Silver Ballpoint Pens, along with 100 Solid 18k Gold Fountain Pens, 100 Solid 18k Gold Rollerball Pens and 100 Solid 18k Gold Ballpoint Pens. The watches will be offered in a series of 333 in Sterling Silver and 33 Solid in 18k Gold, while the cufflinks will be offered in pairs of 333 in Sterling Silver and 33 in Solid 18k Gold. Ultimately, Montegrappa hopes that those in possession of these items will feel a sense of inclusion, and of peace. If you would like to own one of these talismans from Montegrappa, locate a dealer near you from here.